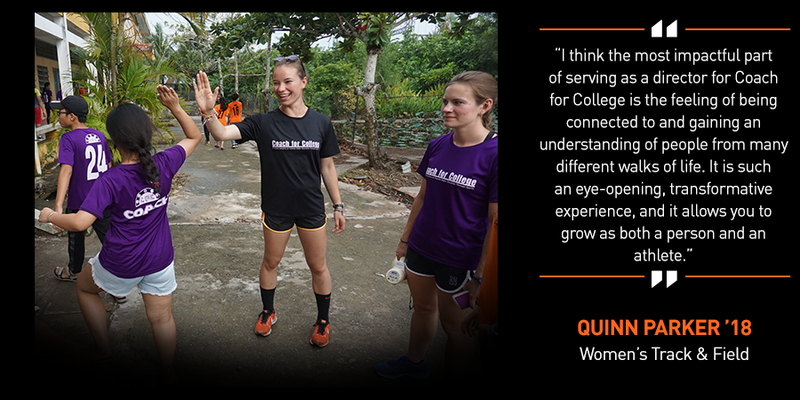 The Princeton Varsity Club is once again partnering with “Coach for College” to send Princeton varsity student-athletes abroad to Vietnam as part of a three-week, sports-based immersion program. The PVC has sponsored the participation of nearly 40 Princeton student-athletes over the first 6 years of the program. Coach for College aims to increase higher education attainment among disadvantaged Vietnamese adolescents using the excitement and life skills provided by participation in sports-related activities. The program provides American college athletes with an intensive and collaborative service experience that engenders the skills needed to exercise leadership and commitment to positive social change. The program is open to college freshmen through graduating seniors. Each student-athlete will co-teach one sport, one academic subject and a life skills class throughout the three-week camp. They will also guide their team of children in competitions each week. Additional program information for summer 2019 can be found here. Be sure to check out our photo gallery of the summer 2018 student-athletes participants, or featured articles on Ben Martin ’20 and Carlie Littlefield ’21 for a more in-depth look at the program and their day-to-day experiences. Click here to view a Summer 2018 highlight video. The application deadline for Coach for College is Wednesday, February 6th. To apply, please fill out the online application form by CLICKING HERE. The PVC will sponsor up to (7) student-athletes to take advantage of this programming during the summer of 2019 and will cover the majority of the cost of participation (roughly $4,180 per person, which covers airfare, ground transportation, lodging, meals, visa processing, health and liability insurance, uniforms and expenses related to cultural experiences). The program does require an additional fundraising component to be completed by the student-athlete (roughly $1,000). Fundraising assistance through Coach for College is available.